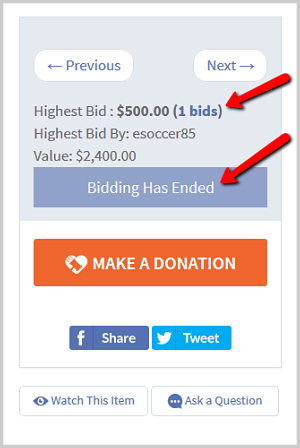 You are here: Home / Blog Post / What’s wrong with online silent auctions this spring? What’s wrong with online silent auctions this spring? Every year my spring season is filled with school auctions. Many of them run online auctions in conjunction with their live events, and the majority this year have complained of lower revenue with the online auction. If you’re running an online auction and looking for ways to avoid a downfall, here are a few thoughts I’ve gathered from conversations with my clients. 1. Marketing your online auction is critical. One of my clients commented that she usually sees a last minute rush of bids before the online auction closes. If you’re seeing a general slow down, ramp up your email marketing. The “build it and they will come” approach won’t work for a live event *or* an online auction. Online auctions are too easy to be overlooked in the dearth of content we all see. So just as with a live event, you’ve got to push, push, push the emails to drive traffic to your online event. I’ve seen groups send two or three emails about their online auction and expect that to do the trick. That simply doesn’t cut it, except in cases of the most dedicated of supporters. If you sense that marketing is your Achilles heel, check out my Marketing Your Auction training will give you the email expertise to drive traffic. 2. Consider whether you want / need outside bidders in your online fundraising auction. Some online auction vendors will advertise your items to people outside your own community of donors. Theoretically more competition drives higher bids. When all goes well, that’s great. But a couple of nonprofits haven’t had that euphoric result. In one case, a vendor was selected to advertise and sell a high value item using its national database. The item (2 sporting tickets) sold for $4k — no more than what my client knows they would have garnered in his own auction. After paying the fee to the company, he said it was a nice experiment, but not worthwhile. In another case spanning a few years, winners continue to claim not to have received the items mailed to them, even after a signature via UPS was required. The nonprofit has little recourse except to let the winning bidder have it for free. When your auction is open to the world, anyone can win and bid items — including scammers. My colleagues in the commercial auction industry put systems in place to vet their own bidders, but in the nonprofit auction space, nonprofits rely on the auction software company to vet bidders — and they don’t. With every upside there is a potential downside. Is your local sporting team in the playoffs? And — drat it! — is that game being played the same night as your online auction is closing? Check sporting and community calendars. Avoid closing your online auction during these times. If a playoffs game has materialized, you might consider moving the auction closing. It’s always a good idea to include extended bidding to garner the highest sale prices of your most popular items. 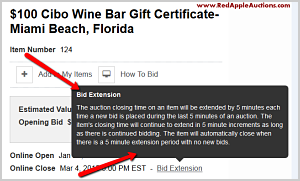 Bid extension option allows for bidding to continue on popular items. I’ve covered that subject extensively already. Read my 2012 blog post My gripe with some mobile bidding and online auction vendors or my 2013 blog post, Ready to see bidders freak out? Don’t include extended bidding. What’s been your experience with online auctions this spring? Having been in in the online auction industry for the last 16 years, the big thing people forget is nothing is free or cures everything. You need to work hard just like your live auction. Make sure you are getting what people want. Golf is a dying industry right now, golf packages won’t garner what they used to. Find the items that will. Don’t rely on outside bidders. You can’t get more than $105 for a $100 gift certificate to the local grocer. Don’t waste your time hoping to get to $106 only to get burned. Extended bidding is awesome, but you have to educate people. Scheduling is tough because your team who notoriously doesn’t make the playoffs is suddenly in the championship or just before you close your auction, the weather finally breaks and everybody runs outside. You have to close your auction on the right days and at the right times. If you aren’t mobile you are dead. 70% of your traffic is coming from mobile and most software isn’t compatible. Google search isn’t listing your items if you aren’t mobile and as a result, your traffic is down. We closed 3 auctions while I read this article. All 3 exceeded goal by 20% and all closed on a Tuesday Night???? 16 years, the old dog may have a trick or ten up his sleeve. Is this the same Chris from AuctionAnything? If so, great to hear from you! It’s been forever! I couldn’t agree with you more and I know we agree on many points. Ironically I was just talking to a client the other day about golf dying. I blamed it on the end of the era of Tiger.